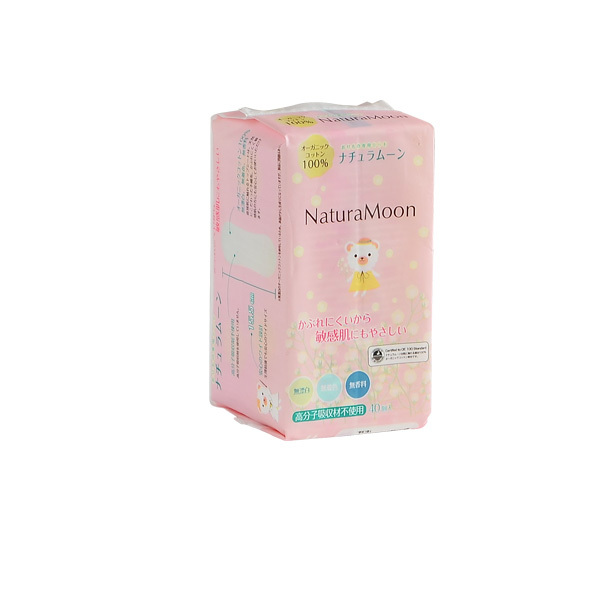 NaturaMoon's top sheet is made with 100% natural cotton and has a gentle and soft touch on your skin. It's a sanitary napkin that's not only absorbent, but also gentle on sensitive skin thanks to its incredible breathability. I've been using cloth sanitary napkins for a few years because I like the feel of cotton. But I've been wanting a reliable and convenient sanitary napkin because it's a hassle to carry a used sanitary napkin when I go out. 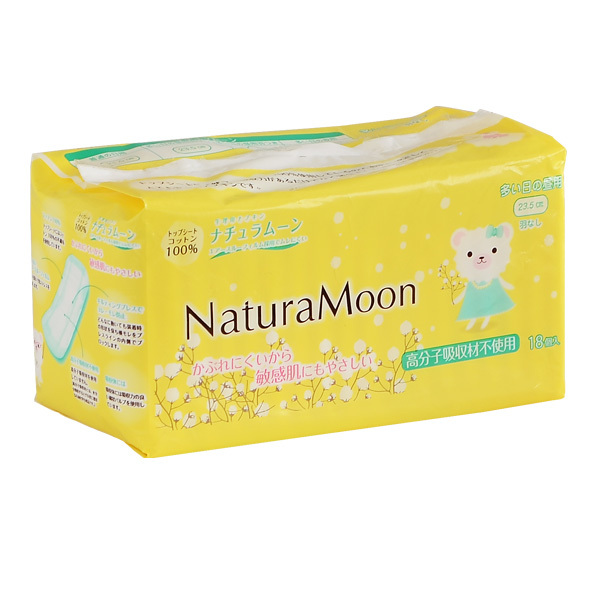 I prefer NaturaMoon because it uses ""100% cotton non-woven fabric"" in the top sheet, and does not use the super-absorbent polymers that are used in ordinary sanitary napkins. super-absorbent polymers are petroleum-derived and absorb menstrual blood and harden it into a gel. It is said that, as the temperature of the gel changes, women's privates are uncomfortably cooled. As sanitary goods are considered a quasi-drug, the products won't be approved as a quasi-drug unless the top sheets that touch the skin are not bleached in white. 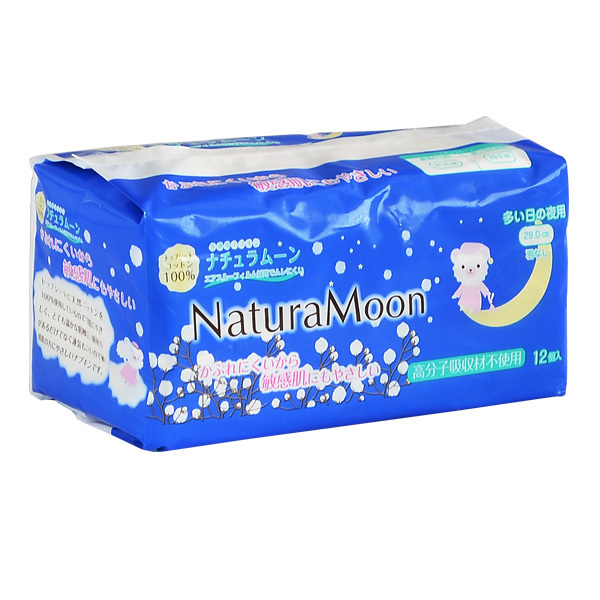 Thereupon, NaturaMoon uses oxygen bleached cotton by hydrogen peroxide on top sheets. This bleaching method, the components are resolved into oxygen and water after bleaching with hydrogen peroxide, doesn't harm human body or natural environment. Cotton-like pulp which has high absorbent is used for absorbent material. I certainly recommend our product to those who have concerns of rashes and stuffiness from sanitary goods. 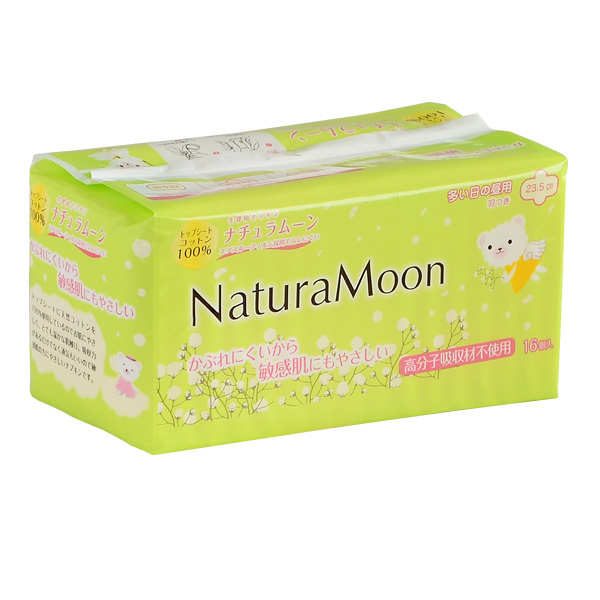 NaturaMoon's napkin is the first product that is made from ""100% cotton top sheets + super-absorbent polymer free"" and that has made such features possible among the quasi-drug approved napkin in Japan. Cotton non-woven fabric, gentle on your skin, is used on for top sheets which touch women's delicate skin. It prevents rashes and even gentle on sensitive skin. Soft cotton-like pulp with high absorbent is used instead of super-absorbent polymers, which absorb liquid and form it into gel. Uses air-through film with good breathability. To be approved as quasi-drug, there are strict rules. For example, the surface (the side that touches your skin) of the sanitary napkin should be white, there should more or less be no smell, and it should be free of contaminants. 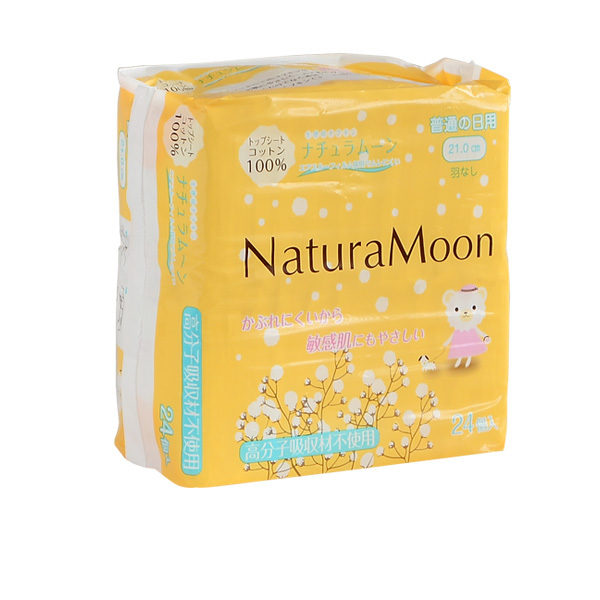 NaturaMoon series sanitary napkins are oxygen bleached by sodium percarbonate, which is said to be environment friendly. Non-woven fabric made only out of organic cotton that obtained ""Certified to OE 100 Standard"" is used in the top sheets that touch women's delicate skin.It prevents rashes and even gentle on sensitive skin. Soft cotton-like pulp with high absorbency is used instead of super-absorbent polymers, which absorb liquid and form it into gel. The lucky charm that only those who use the product know. The charm of good fortune is secretly engraved on the top sheet that touches your skin. 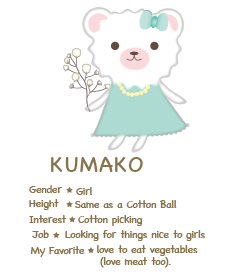 Copyright © 2015 NIHON GREEN PACKS CO., LTD. All rights Reserved.